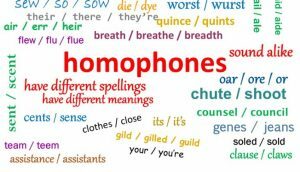 The Tuesday Tricksters series seems to be everyone’s favorite: five pairs/groups of words each week known as homophones that sound alike (or almost, anyway), but are spelled differently and mean something different. They’re the toughest words in English to use correctly, because it’s so easy to mistype one, read it, and say, yup. Fine. Your eyes may not realize that the word isn’t the one you meant. And spellcheck doesn’t help at all! If you spell a word correctly; even if you don’t use it correctly, spellcheck will be happy. You, on the other hand, might not be. So, here for your continued learning pleasure are five more pairs of Tricksters! Are any of these words new to you? I was completely unfamiliar with gneiss, and the definition of both nix and nye surprised me. For more information on these or other English words, visit YourDictionary.com, a terrific resource that gives definitions of words from several dictionaries.